How was your Thanksgiving? Are you ready to go into full-on Christmas mode? 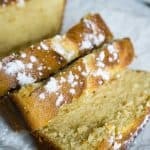 You all know this is my absolute favorite time of year so I am ecstatic to share a ton of Christmas recipes and crafts with you for the next month, starting with today’s recipe for Eggnog Bread. I know eggnog is a polarizing topic-people either love it or hate it. I fall firmly on the “love it” side so this bread it absolute perfection for me. 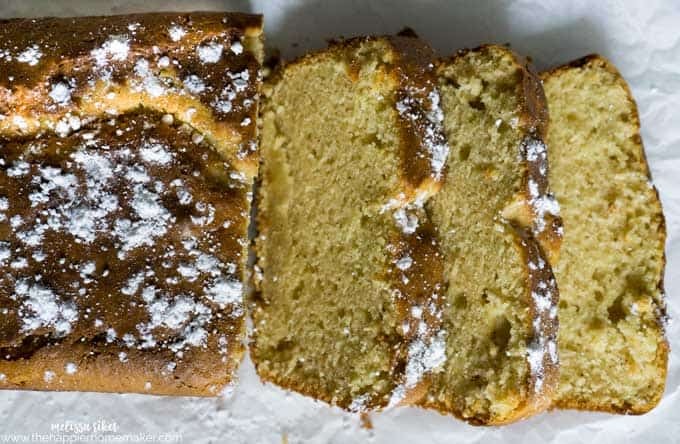 It mixes up quickly and within an hour you can be enjoying this dense, moist quickbread. It’s wonderful warm out of the oven but I actually prefer letting it cool and dusting with some powdered sugar before eating it. I’m not joking when I tell you that every time I make this it lasts less than 12 hours in my house! I hope you enjoy it as much as we do! Preheat oven to 350 degrees. Spray a 9 by 5 inch bread pan with nonstick spray (I like this kind for baking.) In a large bowl combine eggnog, butter, vanilla, rum and sugar until well blended. In another medium bowl mix flour, baking powder, salt and nutmeg. Add flour mixture to eggnog mixture and stir to combine. Pour into the prepared pan and bake for 50 minutes or until top is golden brown and toothpick inserted in the middle comes out clean. Cool on a wire rack. Dust with powdered sugar prior to serving if desired. So tell me, do you love eggnog or hate it? Let me know in the comments! 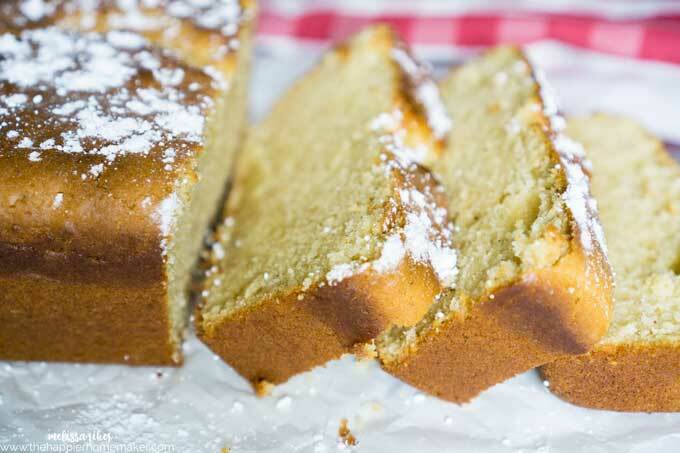 Easy Eggnog Bread is a classic quickbread recipe with a fun holiday twist! Moist, flavorful and always a hit! Spray a 9 by 5 inch bread pan with nonstick spray. In a large bowl combine eggnog, butter, vanilla, rum and sugar until well blended. In a medium bowl mix flour, baking powder, salt and nutmeg. Add flour mixture to eggnog mixture and stir to combine. Pour into the prepared pan and bake for 50 minutes or until top is golden brown and toothpick inserted in the middle comes out clean. Dust with powdered sugar prior to serving if desired. This sounds really good. I love eggnog too. 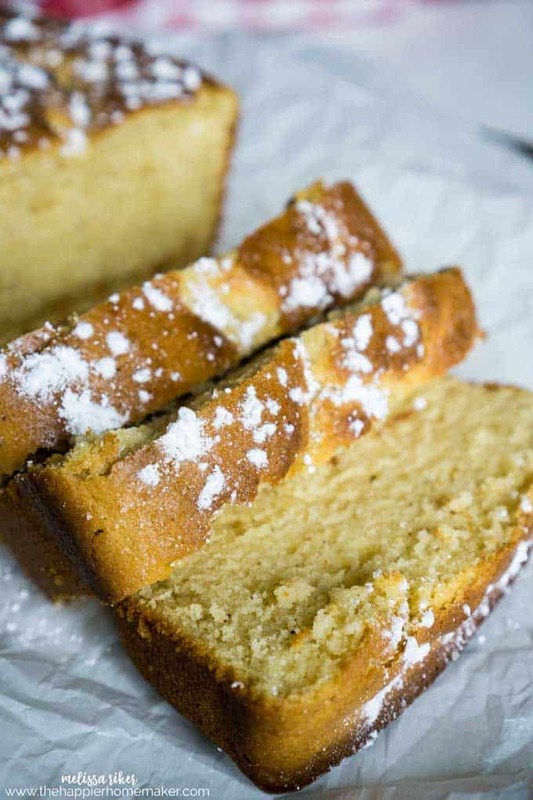 This eggnog bread would be so versatile. I can see it toasted for breakfast or fat slices with fruit or berries for dessert. it into mini loaves as I enjoy finding something new to bake and give as gifts during the holiday season. I tried this bread today, I hate to say but the worse recipe I have tried. First way too much nutmeg, second at the end of baking time it was not done, i baked another 10 minute, tooth pick came out clean. Cooled it 5 minutes when I looked at it, it had collapsed. I just cut it and for sure it needed another 10 minutes. I looked at your picture and it looks like your was not baked enough either. Look at the bottom of yours. I had such high hopes for this recipe, The nutmeg is still repeating. Sorry! I see you adapted it from twelveoeight blog, I will have to compare the recipes. A lot of money to have to throw it out. Thanks for your reply,I followed exactly, I did compare recipes, you did change the amount of rum and nutmeg. Maybe, I am sure I just needed to baked longer, I would reduce the nutmeg and maybe the rum. This has not discouraged me too much I will try other of your recipes at some point. Happy weekend to you. I am allergic to any form of alcohol, what can I use as a substitute for the spiced rum?